Hi. This may be a little early to introduce myself, but I thought I'd do it anyway, just in case you happen to be heading to Knobcone Heights, California, sometime soon. It's the nice, somewhat elite town in the San Bernardino Mountains where I live. Not only that, but I'm about to open my two new stores! They're both bakeries, sort of. I bought an existing store, Icing on the Cake, from my good friend Brenda Anesco, who has to move down the mountains to take care of her ailing mother. She gave me permission to divide Icing into two shops, so half remains Icing and the other is now Barkery and Biscuits, my very special shop where I sell hand-baked dog treats. They're wonderful, healthy treats that I've developed myself as a veterinary technician to make available to dog patients with special health or dietary needs. And they're good! Even people who've tasted them have said so. One fun thing about the Barkery side of the shops is that dogs are welcome there, so I can keep my own dog Biscuit, a golden miniature poodle-terrier mix, with me all the time while I'm at my new businesses. We get a lot of tourists in Knobcone Heights, and quite a few bring their dogs along. Not only that, but people who live here are also owned by a lot of dogs. That hopefully will mean that both of my shops will prosper, since the human recipes I bought from Brenda along with Icing are really good, too. But I have to admit that some of the people here aren't entirely pleased by what I'm doing, especially some of the Ethmans, who are kind of elite and think they run our town. We argue, partly because their family owns a local pet store that they think Barkery will compete with. It won't entirely, since their place doesn't sell hand-made treats, just regular, though good quality, dog food. Even so, when one of them is found murdered with part of a Barkery biscuit near her... well, unfortunately, I'm considered to be a suspect and have to prove I didn't harm her. What happens is memorialized in a book, Bite the Biscuit, which will be published in May of this year. I'm sure I'll be talking about it here more in the future. 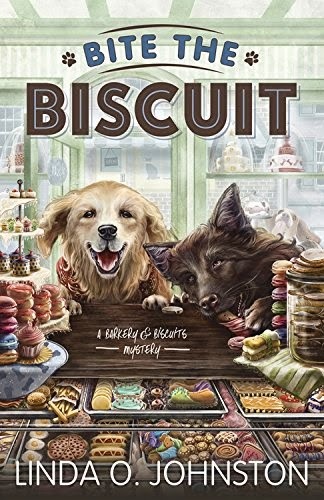 BITE THE BISCUIT, the first Barkery & Biscuits Mystery by Linda O. Johnston, will be a May 2015 release from Midnight Ink. Our person tells us that California is too far from Threadville PA for us to walk to your barkery by ourselves. But don't worry--we'll get her to make us some treats. Will there be recipes in the book? Oh, yes, Sally-Forth and Tally-Ho. There is a bakery recipe and a barkery recipe. I received an ARC of this book at Bouchercon. Moving it right to the top of my TBR stack (so many books, so little time ;-) ). My dog Pep and I would love a Barkery and Bakery! I understand, Grandma Cootie. I hope you enjoy it, and Pep does, too! I love the idea of a bakery for dogs and people. Although I don't have dogs at the moment, my rats like dog treats. And perhaps you make baked goods for cats and horses. I'll take some of those. I look forward to reading this book! Thanks, Katreader. So far the treats are only for humans and dogs (and maybe rats), and the humans can also eat the dog treats but not vice versa since some people treats have chocolate. Since I'm also a veterinary technician, I might expand my products to be good for other animals, too, though. I love Linda O. Johnston's books. This new book sounds like another winner. Linda told me to tell you thanks, Chris... so, thanks from both of us! Oh, this sounds just wonderful! I love that cover, too.